Cookies & Candies: Isabel Marant Dicker Boots lookalike? Isabel Marant Dicker Boots lookalike? 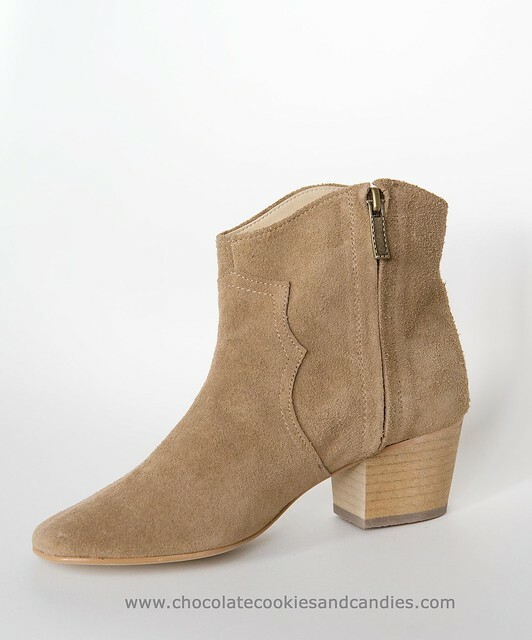 Back in September 2011, after months of mooning after a pair of these cult status Isabel Marant Dicker boots which I can't wear, thanks to my child-like sized feet, I had a pair custom made at Pretty Small Shoes. They were one of my best purchases last year. I've worn them to death and am thinking of stockpiling a few pairs, just in case the company stops making them. I'm afraid mine no longer look as pristine as the photo below. While strolling around Mayfair area in London, I caught a glimpse of these Dicker boots in the window display of Russell & Bromley. Turned out these are copies. The quality is no better than my £139 custom made ones but at £275, I'd much rather buy the real deal which are only £55 more. While as a consumer, I'm pleased to have cheaper options but I don't think Ms Marant will be too happy to see these. 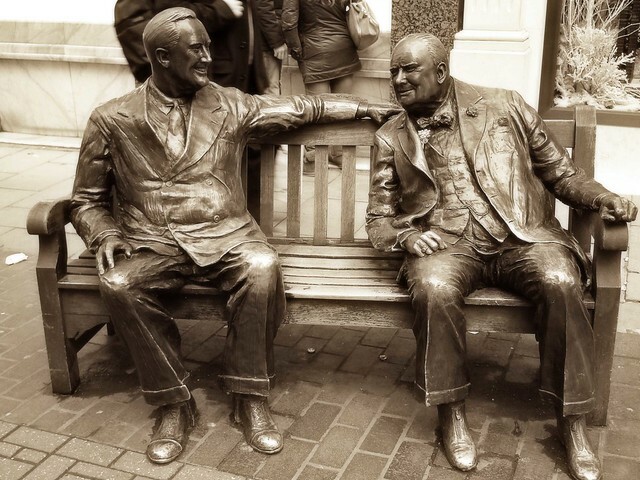 I can't resist including this shot of Roosevelt and Churchill having a chat, right on Bond St. I've always loved that bench! I have pic of myself wedges in between them, I always tap them on the head when I go by - yes I'm weird that way. I like the little gold ones on the far right, but I'm with you - I'd rather pay a little more for the real thing! @Tabitha, hahaha...you're not the only one. I've see plenty of tourists - big and small trying to wedge between the two sculptures. Never cease to reduce me to giggles. The Blonde, I'm just amazed that they're charging so much for them! Kim, I guess people like me will have to resort to custom made stuff. *sigh* It makes visiting shoe stores even amazing ones like Selfridges a very depressing experience. Laura, I'd say go for the one closest to your skintone because it really elongates your legs. After reading 3 months worth of posts into 1 hour i think i am done for today and time has come for me to comment. so as i've found out not only you are a very inspirational and talented blogger but a wonderful person as well after reading your "abortion" post i have more respect towards your person than ever. i think this kind of posts need to be written. although i still haven't written a similar one, i have written two posts that i think that you could read. a new blog overall and still have lots of things to change and better up but a few minutes to check it out would mean a lot to me. as for your shoes, it happened to me too, once i bought a pair of shoes with amazing quality and very comfortable that costed 130 euros and then i saw a replica of them that costed 200 euros and seemed cheap and was super uncomfortable to walk around with. i am sure Ms. Marant wouldn't be happy at all. p.s the statue is so beautifully made, it seems like they are real and they are breathing and laughing. p.s i decided to follow you via GFC and bloglovin in case they shut down GFC. and that's what i am telling my followers too, if you are following me already follow me via bloglovin too. we don't want to loose our followers right. i hope u read this and have time to reply. by the way i checked out your store, i love the hermes cuff bracelet but its a tad expensive for me to buy without spending all my money. Maria, I don't think IM will be all that happy to see her hard work resulted in knock offs. Marianne, what a lovely thing to say! Thank you! ACC, thank you for taking the time to write. Much appreciated! These Dickers aren't cheap but I think they're worth the price. I'm lucky in the sense that I'd found an alternative in my size for a little more than 1/3 of the price. BTW, your blog is sensational. You're incredibly creative and talented. Your boots look great. I'm so glad you were able to find something that fits. They look wonderful! 275 for copies? They must be mad! They seem to be holding up great too! I've been searching around posts on ankle bots lately. Been wanting a pair for the longest time and I've no idea how to style them. I need inspiration! F*ck, that's just annoying... I bought my boots when they weren't popular at all, and even at that time I tried to find more reasonably priced knock-offs in Paris to no avail.. and now they're everywhere. So annoying. fouled. What happened to the Golden State Warriors on Wednesday has not happened to them in over 15 years.